It has been confirmed by the Fire & Ambulance Services that a number of houses were on fire on Monday 28th January, 2019 in Hillsborough Street. One individual was taken to the hospital as a result of the fire. Public Relations Officer of the Dominica Fire and Ambulance Services, Wayne Letang said at approximately 8:30 pm the Fire and Ambulance Services responded to the fire near the Big Edge Financial Center and the Government Headquarters. 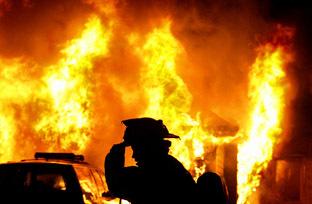 The fire affected two residential structures. One building owned by Lario Antoine which was sub divided into three residential units. One occupied by the owner and Mr. Anwar Charles was a tenant in the other unit. Two other units and there contents including that of the owner were totally destroyed. While the third sustained significant damage. A building owned and occupied by Alice and Harrison Williams also sustained marginal fire damage to a section of the roof. Antoine was transported to the A&E Department of the Princess Margaret Hospital for observation and was later discharged. Investigations revealed that the fire origin was from the residence of Mr. Antoine and the cause of fire is suspected to be of an electrical nature.